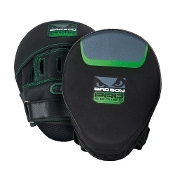 Bad Boy Pro Series 3.0 Precision Focus Pads are the training pad to improve on fast pace mitt work. Smaller target area lets the holder move quickly between strikes and keep up with people with any handspeed. High compression EVA foam padding protects the holder and striker?s hands.